He's a world famous actor and she's a high-profile human rights attorney. And George and Amal Clooney looked like a perfect power couple while making their way to the United Nations Correspondents Association Awards at Cipriani 42nd Street in New York on Wednesday. The striking brunette, who was being honored as 2018's Global Citizen of the Year, made quite the impression in a gauzy blue and white number with a plunging neckline. Amal's semi-sheer voile frock teased her long legs as it got swept up in the wind, also revealing a pair of color-coordinated navy shoes. She kept her accessories at a minimum, opting for only a simple snap clutch. Adding some Hollywood glamour, Amal swept her hair to the side and styled it in full-bodied curls. The Beruit-born attorney played up her natural good looks with a hint of red lipstick and polished eyebrows. 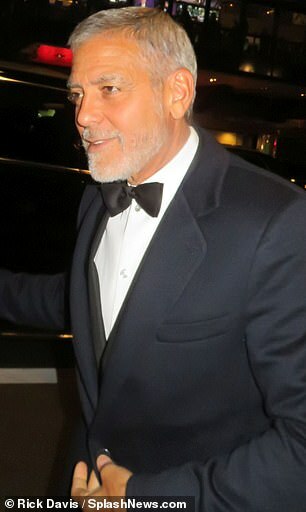 The mother-of-two walked into the soiree on the arm of George's father Nick, who was dressed in a classic tuxedo. 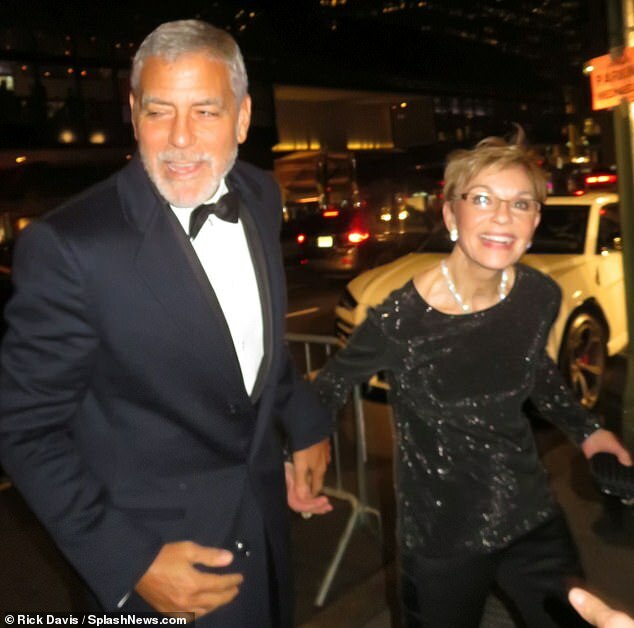 George, meanwhile, escorted mom Nina Bruce Warren into the affair. He looked dapper in suit with a bow tie, wearing a hint of snowy stubble across his jawline. Mom Nina was thrilled to be out on the town, donning a glittering black top and trousers with a diamond necklace to the party. It’s date and family night for George and Amal Clooney! 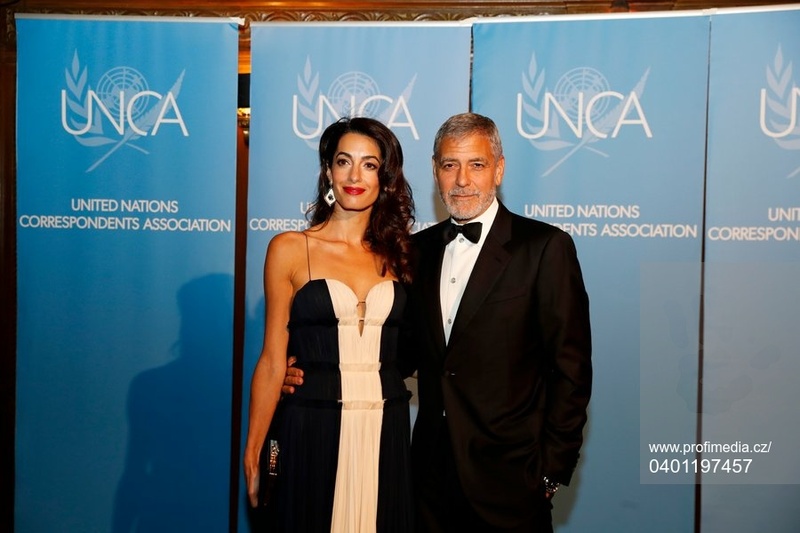 The couple, along with Clooney’s parents Nick Clooney and Nina Bruce Warren, stepped out on Wednesday evening to attend the 23rd Annual United Nations Correspondents Associations (UNCA) Awards in New York City. Amal, 40, who wore a navy and white chiffon gown with a sweetheart neckline, was honored at the event with the 2018 UNCA Global Citizen of the Year Award. As for George, 57, he kept it traditional with a classic tuxedo for the ceremony. His parents joined him in donning formal attire — his father, 84, wearing a black tuxedo, and his mother, 79, opting for a long-sleeved sparkly gown. During her acceptance speech, Amal paid tribute to Nadia Murad, the co-winner of this year’s Nobel Prize, and thanked her father-in-law — who is also a journalist — for raising her husband well, according to a guest at the event. She also explained that the couple intends on “monitoring trials of journalists” and helping them financially, as well as supporting the endless accounts of journalists ranging from the Maldives to Egypt. “I am here tonight to honor you, the journalists being recognized for your groundbreaking reporting this year,” Amal said in a clip recorded by a guest. At the prestigious awards ceremony, which honored the best print, broadcast and electronic media coverage of the United Nations, U.N. agencies and field operations, over $60,000 were distributed among the prize winners, which was available to journalists around the world, according to the UNCA website. As the year comes to a close, the couple has been honored at several awards ceremonies. 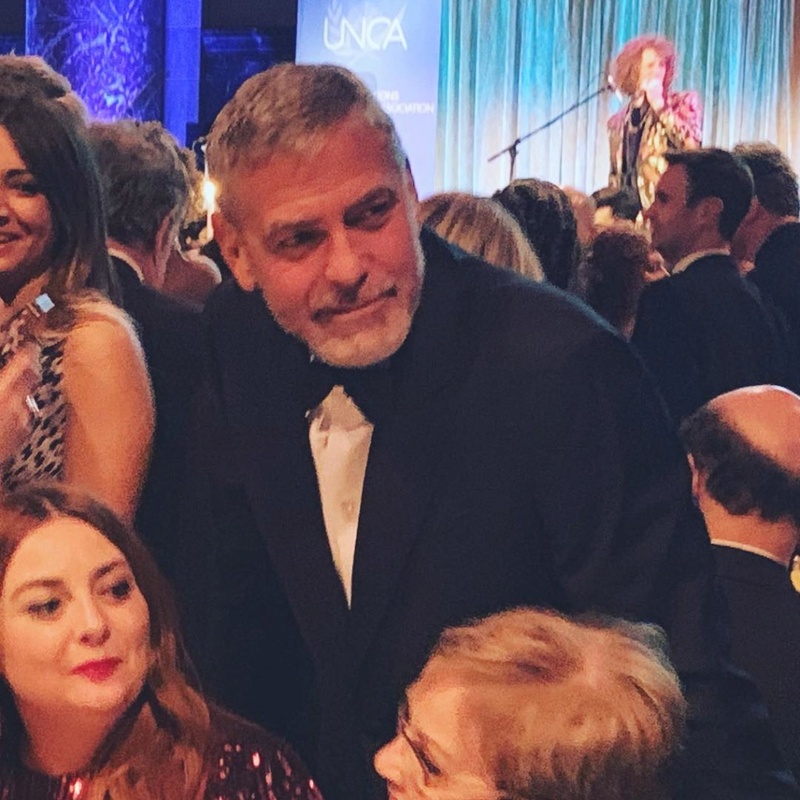 Most recently, Amal was honored at Variety’s annual Power of Women luncheon, where George introduced himself to the star-studded crowd by using his wife’s moniker. Amal, however, wasn’t on hand, as the human rights lawyer was giving a keynote speech in Philadelphia during the 2018 Pennsylvania Conference for Women. Months earlier, Amal was happy to get on stage and share how she felt about her husband at the AFI event honoring George with a Life Achievement Award in Los Angeles. The human rights lawyer also touched on his incredible generosity, and how she thought she’d be a single forever before they met and began dating, before getting personal about what an adoring and devoted dad he is to their twins, Ella and Alexander, 1. “He is the person who has my complete admiration and also the person whose smile makes me melt every time,” she added. God is patient. When you have a soul enveloped with the goodness of God, you will eventually end up at the God question. The good news is God knows the "intent" of the heart of every person. When you go back to the beginning you will find the "intent" that defines the behavior. It's easy to look back, with what we now, and ask that question. You can't change past behavior, however it's never to late to find a better direction. I've followed the life of George Clooney over the last 10+ years, from the core of his being is a soul that envelopes the essence of God. I have no doubt he will take the time to evaluate actions, take responsibility for those actions, and move into a renewed outlook on life. It's very nice for her to get this award and they both looked good, but the best part of this to me was that Nick and Nina were there. It makes me wonder if G&A were at Nick's event on the 4th. George waited so long to start a family, if his kids are going to know their grandparents at all they'll have to spend as much time as possible with them now. LizzyNY wrote: It's very nice for her to get this award and they both looked good, but the best part of this to me was that Nick and Nina were there. It makes me wonder if G&A were at Nick's event on the 4th. I feel the same Lizzy. George and Amal seem to have very strong family ties and I think they will make sure that Ella and Alexander will spend as much time as is possible with both sets of grandparents. 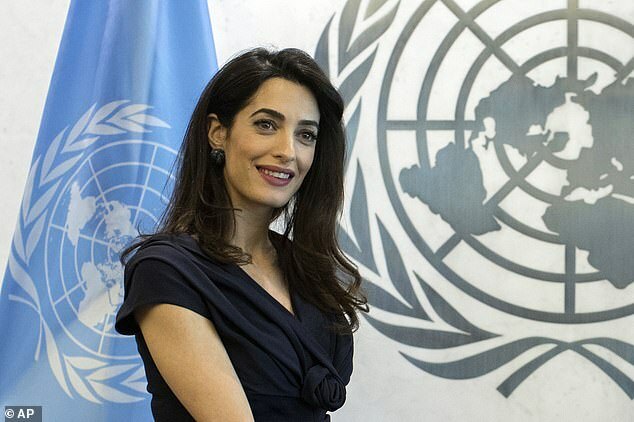 Good for Amal for receiving this special honor from the UN. I applaud her for calling out Trump in her speech. I feel really strongly that those who have a public platform and especially those who defend human rights and freedom of the press speak the truth about Trump (and by his name) as often as possible. Such an impressive speech . And a massive plea for free speech and protection of journalists worldwide - thanks for the find, Hairyhound. Love that she acknowledged all that George - and Nick - have done, and what they are now doing at the Foundation to monitor Isis suppliers like the French company Lafarge. party animal - not! wrote: Such an impressive speech . She always has. Nothing new. And thank goodness for people like her. I was at a Reporters Without Borders press conference in London focusing on Kadija Ismayilova who was being interviewed by satellite from Azerbaijan from her flat having just been released from prison by the corrupt secret service...and even then the intimidation continued as they cut the cables while she was speaking. But the First Family there had to release her because just the fear of the international backlash and publicity her lawyer (Amal) would create and release to the world would mean their activities, corruption and Kompromat would be exposed . I pay attention to the narrative that is spewed by the media and I pay attention to who's driving the narrative. 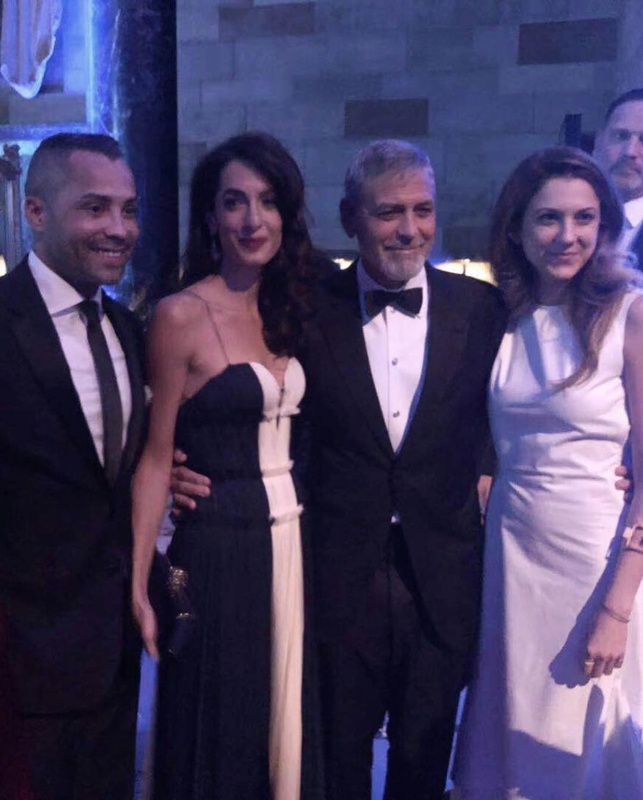 I found your post to connect , George and Nick Clooney, the "Foundation investigating French ISIS suppliers " to Amal's "journalism narrative" very interesting. I agree, the rights of journalist has been one of the major narratives connected to Amal's cases. Interesting it was a Saudi National connected to a U.S journalism that went missing and presumed murdered that the U. S. Congress found the need to investigate. I also find it interesting neither Amal nor the U. S. Congress found the need to call for an investigations on murderous attacks imposed by ISIS on United States citizens (like San Bernardino). The TRUTH is French journalist have been on the ground documenting the TRUTH regarding middle east conflict and have suffered many attacks at the hand of ISIS because of their investigating reporting. However the "narrative" of the "fact finding truth" of French journalist is NEVER the narrative of mainstream media. I've noticed Amal's support of Journalist, however I've never heard he denounce the attacks imposed by ISIS on journalist. Please don't misunderstand me, I know Amal's position is to stand for the rights of journalist, like when a Journalist is unjustly jailed. Amal's cases are NEVER litigation against attacks imposed by ISIS on JOURNALIST. Amal's narrative is always on their right to the free press, not on murderous attacks imposed by ISIS on the free press. Amal seems to be in the midst of the narrative, however stays away from narrative about murderous attacks impose on journalist at the hands of ISIS. Amal cannot be held responsible for what US Congress doesn't do! I note that the entire news editorial team of the Capital Gazette in Annapolis killed by some madman with a gun has also gone unnoticed recently. As an international human rights lawyer she would not necessarily be able step in for Congress. Just to be clear, I'm just making the comparison, I'm in no way holding Amal accountable for the actions of the U S Congress. Ladybug- 1. Mainstream media tends to focus on events and people impacting their home markets. If it happened far away to someone their followers wouldn't know they tend to give the event short shrift - if they cover it at all. 2. Amal works for people who hire her. If she isn't hired to pose a case against ISIS, she can't do much other than talk. The "awards" events and speaking engagements give her a wider audience for the issues she's involved with. Through the cases she is hired to work on she has taken the ISIS issue to the UN and to court. LizzyNY wrote: Ladybug- 1. Mainstream media tends to focus on events and people impacting their home markets. If it happened far away to someone their followers wouldn't know they tend to give the event short shrift - if they cover it at all. Lizzy totally agree on your Amal perspective. Like Amal works for people who hire her, those driving the NARRATIVE of the media WORK for people who HIRE them. The overall freedom of the press"NARRATIVE" regarding "journalist" is what I FIND interesting. What about the freedom to go to work and not be MURDERED by ISIS? I WILL NEVER FORGET, THOSE WHO WENT TO WORK AND WERE MURDERED BY A FELLOW EMPLOYEE who left an employee meeting, went home got his wife, came back with automatic weapons, and MURDERED the people he worked with everyday. I WILL NEVER FORGET. Why the U.S. Government - Congress is this involved in a Saudi Native connected to U.S. Journalism who went missing in his NATIVE country and is "presumed" murder by people in his native country and NOT insist on a full CONGRESSIONAL investigation regarding actions imposed by ISIS on US citizens we KNOW were MURDERED by ISIS in our own country, I HAVE NO IDEA. The TRUTH is Pres Trump's "fake news" HAS SOME MERIT!!! As of late. more time is spent on "freedom" of the press instead of FACT FINDING "TRUTH" discovered by the press through investigation journalism. Bottom line: the media is DRIVING the narrative of the people they work for. Ladybug - I don't know what ISIS directed murders of American journalists here at home you are speaking about. A mentally unstable person who kills the people he works with - whatever his stated grievances- is not proof of ISIS directed murders. It is proof of a country failing to provide adequate services to the mentally ill and allowing them unchecked access to weapons. If you want people to be safe in their workplaces write your government representatives and demand they enact strict gun laws and fund services for the mentally ill.
America is supposed to stand for certain ideals, one of which is freedom of the press. Our founding fathers considered it to be extremely important to have an independent press, which is why they put it into the Constitution. It is one of the things that elevates us above many other countries and is one of the reasons America has (until now) had the respect of much of the world. Why do you think Putin is working so hard to destabilize our institutions - especially the press and our electoral systems? Trump's "fake news" mantra is a page right out of the communist playbook. He lies about everything. Then he lies about his lies, making it impossible for the people to trust anything. Maybe he thinks he can destroy our system and make himself king. Maybe pigs can fly. It is really nice how she thanked Nick for raising George as a good person. LizzyNY wrote: Ladybug - I don't know what ISIS directed murders of American journalists here at home you are speaking about. A mentally unstable person who kills the people he works with - whatever his stated grievances- is not proof of ISIS directed murders. It is proof of a country failing to provide adequate services to the mentally ill and allowing them unchecked access to weapons. Thank you, just saw it. It was a great speech. but the part I loved the most is, obviously, the one where she talked about Nick and George. George got so emotional, it was very sweet. For the love of everything holy- will they pleeeeeeeeeeeeeae stop with the " oh we're so in love" calculated poses. I absolutely LOVE these pictures. George Clooney as the Leading Man NEVER gets old. They are in love and it's nice to see to see them show it. I love the affection between the two of them. Sweet picture. There is no more affection on either part.It is only a show. George is afraid he may lose his adorable twins in case of a divorce and she is manipulating him and his parents using them and their cute children as tools for her career, her expensive fashion and exclusive lifestyle she has experienced since her marriage to George. She is a self-centred, self-contained person who loves herself more than anybody or anything in the world and she would never let him go. Everything has to work as she wishes to otherwise there is big trouble. It was totally inappropriate to praise George’s father for having made a good man out of George as if they needed any praise in public from her. She was talking to them from a pedestal of faultlessness as if she were the univetsal authority of ethics Like at the AFI Awards she showed sort of a motherly behaviour trying to tell her child or teeny he is good but there still something to be changed in his behaviour. Her fame/celebrity is an artificial construct based on connections, influence and money, styling, desi,gn clothing, jewelry, a.s.o. to put her in scene while smilingly talking about crime, terror, oppression, injustice, lie in politics, all themes people who are hiring and ask her to speak of because through her appearance she may attract attention upon them. But sometimes her inappropriate outfits mostly distract attention from the topic. Unfortunately most people let themselves be influenced by such outward superficial behaviour. Why on earth has she got that UN prize? Only because of speaking about the evil aspects of life in any part of the world?Wouldn’t it have been more advisable for the U N to have chosen Nadia or a journalist (Kashoggi) who have experienced ordeals and injustice so much? I think George has become aware of Amal’s real character, perhaps it takes time for the rest of people to do that, but she will be very clever and careful with the help of her mother and her family in using all her capacities even George’s wealth and support to make her way where ever she wishes to. Into politics, who knows? She has lost any sense of reality. Proof is the way she dressed in such loud colour in Oslo again upstaging Nadia as if willing to say:’ Look here, it is me who Nadia has to be grateful for’or even worse ‘I deserve the Nobel Prize!’. I know lots of highly intelligent, honest and humble people who work from the underground and manage to achieve much more than she has done in her.two year’s activity as a highly distinguished and worldwide known/renowned human rights lawyer. George is a very sensible person, with much common sense and understanding for those living on the other side of good life (Look at the pictures with the beggar. He talkls to him and I think he even goes back to the entrance of the hotel maybe to fetch something for him whereas Amal is looking at the cameras not giving one look at the poor man). He is empathetic, sociable, enjoys partying with family and friends, a simple guy whom Amal’s conceited nature must have turned to be a burden.He had chosen her just because she was different to all his previous girlfriends, but in the long, wealth and fame have definitely changed her or what is even worse she may have concealed/stifled her greed for wealth and fame until she caught him and gave birth to the twins knowing that from then on she would have a firm grip on him for good. I feel so sorry for George and the fact that he gets emotional in public testifies that he really is a good man being aware of Amal’s intentions. He was rather sad at the UN venue and the way they arrived and left at the Cipriani , their gestures speak volumes. She smiles like a canary who has caught the cat and he is sad trying to slip his fingers from her grasp/grip. Well, he's clearly hating that kiss!! And you think his emotions at the AFI when Amal spoke were a desperate coded message that he wishes to escape? This was the UN Correspondents Award to Amal - and part of a very much needed plea by journalists around the world to have a free Press without fear. Hence the current Time edition with journalists voted Person of the Year, and the Chatham House Prize being awarded to the Committee to Protect Journalists. The minute or less of their arrival and departure was notable for the unusual number of security men, and concern for the family for reasons we will never know and possibly Nick (who may be unwell). The 'beggar' was Radioman, a character/celebrity whom George knows very well, as do most celebrities and whom Amal has met before. You speak as if you know her personally and resent her success. I notice that in your description of her success, you seem to have omitted any mention whatsoever of her international legal skills - and without any of those she would not be where she is today, like it or not. George and she have so much in common it was surprising that they had never met before. Maybe they have Kofi Annan to thank for that. Adriane - Sometimes you just have to accept things you cannot change. George married Amal because he wanted to, and she seems to be making him happy. If she is even half the manipulative, power hungry gold-digger you describe , would George have tied himself to her? He's been around long enough to spot a phony. If that's what she is, then that's what he wanted. party animal - not! wrote: Well, he's clearly hating that kiss!! In the thought to thought picture George Clooney looks like a man in love to me. 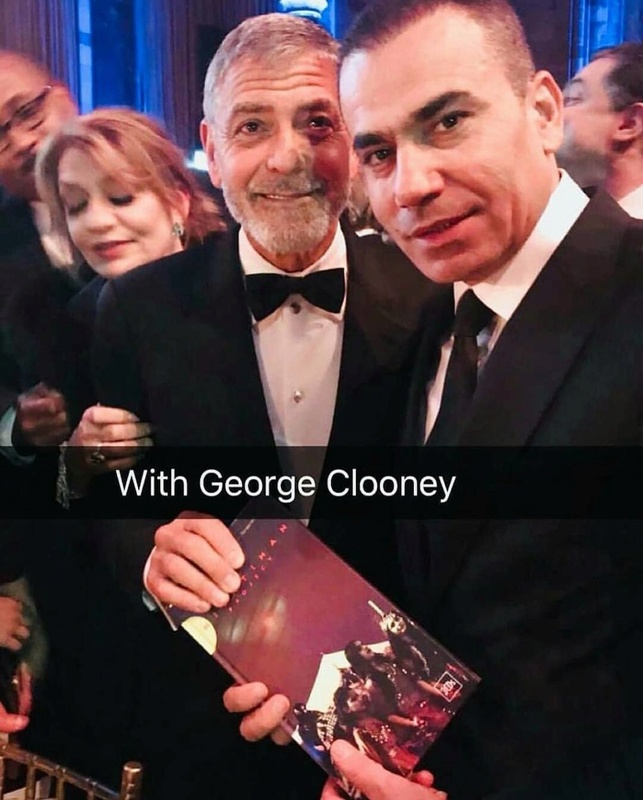 However, in almost all the other pictures for this event George Clooney looks miserable. I had a difficult time finding a picture where he's smiling to post on my favorite thread. George found the woman he loved more than any other and who loved him. He married her and he has said himself they are a perfect team. Amal according to not only her husband but their friends and family is a wonderful woman. George would never marry anyone who wasn't. Nor would he stay married to someone who was a user. He has what he needed a family and he is happy that is all that matters. annemarie wrote: George found the woman he loved more than any other and who loved him. He married her and he has said himself they are a perfect team. That's really good to know. I hope they have a long and happy life. What happened outside the Cipriani? What did I miss?